In Jodhpur’s Jilaa district yesterday, Vikalp Sansthan in partnership with the Department of Women and Child Development held training for Protection Officers concerning the 2005 Protection of Women from Domestic Violence Act (PWDA). The training, which was facilitated by Usha and Yogesh of Vikalp, had 40 attendees who were protection officers, advocates, police officers, judicial officials, media representatives, Mahila Suraksha Evan Salah Kendra counselors, social workers, and representatives from other NGOs working on this issue. During the training, there were four speakers who sat on a panel at different times to discuss the act and answer any questions the participants had. The speakers included Deputy Director of Women and Child Development, Secretary of Asha Botra Meera Sansthan, Up jila Parmukh Heera Lal Mundel, and Chief Justice Sri Mukesh. The main topics discussed during this training were the parameters of PWDA, the roles and responsibilities of protection officers and other governmental officials under PWDA, and the process and timing of filing incident reports on behalf of victims in the courts. During the training a couple of other important issues were also raised. The first was that of having a shelter home for the women. Many of the attendees believed that a shelter home was needed for women who decided to take legal action, and were in need of a place to stay until there court case was decided. Other issues raised by the attendees were questions related to police responsibilities and duties under the act, and also how the judicial process worked. At the end of workshop, all participants decided to create a committee in support of the shelter home proposal, and to also pressure officials at the district level and state level about the proposal. Another group of participants decided that they would conduct an analysis of all pending court cases under PWDA, and meet with the related judicial officials to discuss these cases. Lastly, the participants along with Vikalp Sansthan decided that they would advocate for the police to paste all Protection Officers’ names and numbers in all police stations, and create a pamphlet listing all Protection Officers’ names and numbers for distribution. After the training’s conclusion, many participants expressed that the training was useful for them because they were able to ask questions about PWDA and their role as protection officers, and discuss the problems and challenges they have faced so far as public servants. Vikalp Sansthan staff members traveled to Mount Abu for a three-day workshop and retreat on the 13-15 of May. Its purpose was to develop group unity, review existing programs, create future plans, complete an annual evaluation, exchange ideas, and refresh the workers’ minds and attitudes. Over the three days, staff presented their specific department work (like Child marriage, We Can, Child line, Roshani Resource Center, Violence Free Zone, Aapani Dikari Ro Haq) watched several documentaries, shared personal stories, and participated in team-building games. Staff members’ stories about their personal involvement with Vikalp and the founding of the organization touched many workers, deepening the meaning of their contributions to Vikalp. Department presentations allowed programs to be viewed with new eyes, as staff members questioned, critiqued, and applauded their colleagues’ work. Further, staff stepped beyond the typical PowerPoint presentation, and demonstrated their work in creative formats like skits. This cultural expression allowed Vikalp staff to perform a certain scenario and test out their corresponding support programs. Individual teams evaluated their strengths and weaknesses and made plans accordingly for the next year to improve their team performance. Staff also looked to the future, and expressed the dream for their work five and ten years from now. Other than professional activities, the members participated in exercises to enhance group cohesiveness like a campfire, cultural activities, team-building games, and role-play. For example, staff played ‘tug-a-war’ to emphasize teamwork; they engaged in an airplane game in which staff wrote three qualities about themselves on a plane and if another colleague could identify the person based on the characteristics, they received points. Additionally, staff participated in a plate game in which staff wrote qualities they admired about their colleagues on their plates. Through these activities, Vikalp staff expanded their program knowledge, obtained a greater understanding of Vikalp’s founding and structure,furthered professional relationships, and created a stronger work environment. Kusam, Yogesh, Ridmal--The three first members of Vikalp. 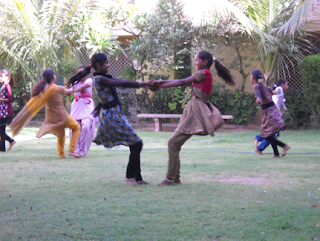 Vikalp led a two-day camp for adolescent (kishori) girls on the rights of women, the importance of girls’ education, and stopping domestic violence (gharelu hinsa) in both Jodhpur and Jalore. 40 girls from seven villages united in Jalore to participate in this creative training session and another girls came to Jodhpur from ten villages in the Luni block district. 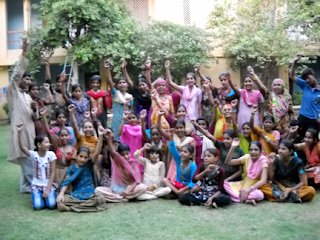 Usha, the director of Vikalp, guided the girls in collaborative activities to voice their feelings and experiences. 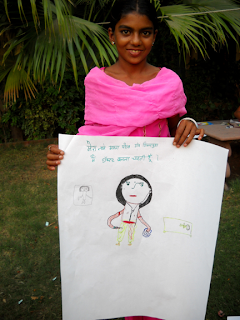 For example, each girl described her dream with the group and drew a picture of what she wanted to be in ten years. The drawing would hang on her wall at home as a reminder to pursue her education and speak out against violence in order to realize her dream. The girls watched a documentary and performed skits, as well as participating in numerous songs, dances, and games to help build confidence. The group ended the camp by sharing their new knowledge, such as how to stop child marriage in the village, go to school irrespective of difficulties, or remain in a group while managing her own needs. The girls pledged to use these lessons when they returned to their respective villages, helping to promote equal gender norms and a violence free zone. The girls also took the responsibility upon themselves to promote girls’ education in their villages by traveling from home to home, spreading the important message to girls and parents to continue higher education. Case study: Shobbha is from Bavabi village, and this was her second time participating in a Vikalp camp. In the first training she gained a lot of self-confidence, so she eagerly shared her experiences with the group. Her dream now, she explained, was to continue her education and become a social worker. She wanted to continue all the work that Vikalp does with women. The lessons and confident sense of self she gained from the workshop, allowed her to raise her voice at home when her father domestically abused her mother. She spoke out on behalf of her mother and helped her to safely find help.